If you're gung-ho on upgrading to the iPhone 5 and have a mountain of old accessories from previous generations of the iPhone and iPod, this is the ugly adapter you'll need to buy for all of your deprecated gear. 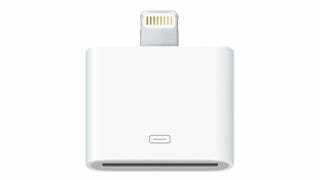 The iPhone 5 introduces a new, and considerably smaller, Lightning connector that's incompatible with every single Dock Connector accessory ever released. It's officially called the Lightning to 30-pin Adapter and is available for pre-order for $29 starting today, while it ships in October. Wait, what? If you were hoping to use your new iPhone 5 with your old accessories next week, that's apparently not going to happen for at least a few more weeks.